When most Americans think of Indian music and dance, the first thing that comes to mind is often Bollywood, with its riotously percussive celebrations of youthful beauty and physicality. But that’s not the kind of music featured in the biannual IPFW and Shruti Indian Performance Series. Instead, audiences are treated to longer, more improvisational pieces from classical traditions, which can be intimidating. Like Western classical music, traditional Indian songs are often solely or predominantly instrumental, with slowly unfolding stretches of contemplative phrasing, building only on occasion to more upbeat tempos. In northeast Indiana, the interest in traditional Indian music was far greater than even the events’ organizers anticipated. It started largely through serendipity. Dr. Vijay Chilakamarri founded the Shruti Organization and began what would become the IPFW and Shruti Indian Performance Series after spending years driving his daughter back and forth between Fort Wayne and Chicago so she could train in traditional Indian dance. “I just wanted her to do something nice back in town,” he says. 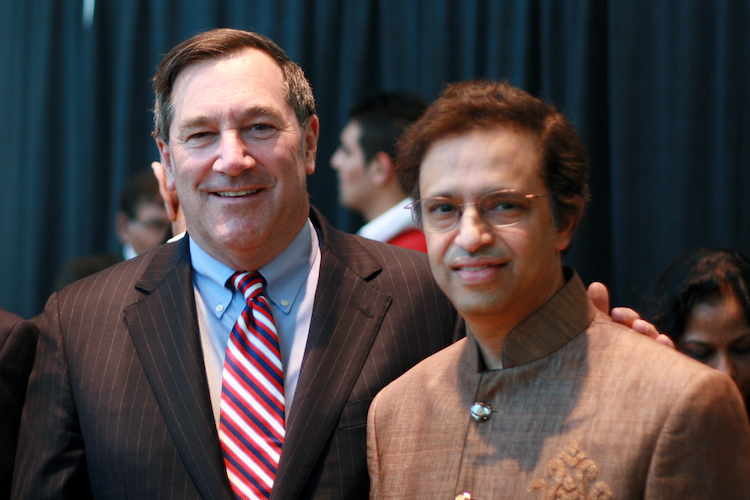 Shruti's founder, Dr. Vijay Chilakamarri, right, with Sen. Joe Donnelly. Chilakamarri had made his career as a cardiologist at Lutheran Hospital, but he’d grown up in India, and it was important to him that his children have a chance to learn about the culture and traditions of his birthplace. “Tomorrow, it’s not fair for me to say my kids don’t know anything about Indian music if I didn’t introduce it to them,” he explains. Around the time Chilakamarri was looking into possible venues for his daughter’s performance, John O’Connell was transitioning into to his current role as IPFW’s Dean of the College of Visual and Performing Arts. “The year we began our discussions was also his daughter’s graduation year,” O’Connell says, “and in order to be certified and graduate to the next level, she needed to do a single individual concert, which he booked in our Auer Hall,” which is part of the university’s Rhinehart Music Center. 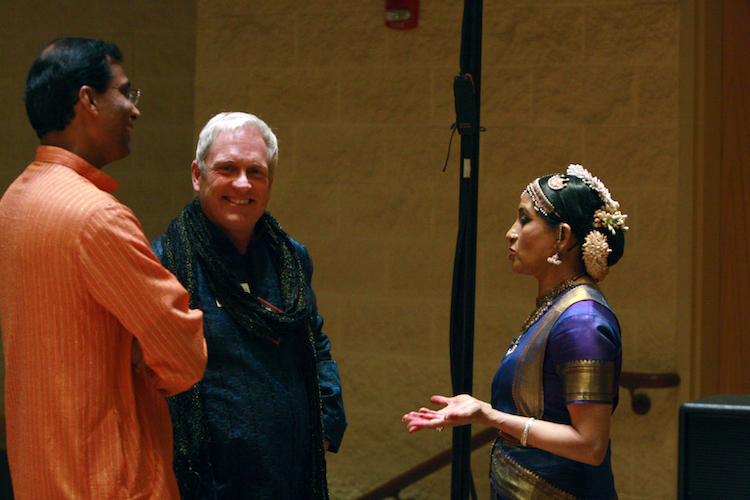 IPFW Dean John O’Connell, center, talks with Shruti performers. As Chilakamarri discussed renting the hall with Dean O’Connell’s predecessor, Chuck O’Connor, a larger vision started coming into focus. Far from being reluctant to host the performance on campus, the IPFW dean and professors attending the presentation saw it as an opportunity for their students to learn. Their response to Chilakamarri’s presentation was, “Can we come and watch?” he says. Thus, his daughter’s first performance in Fort Wayne was attended by a sizeable and intensely curious cohort of non-Indians. Little did he know it would be the first in an ongoing series of performances that would bring some of the biggest names in traditional Indian music to northeast Indiana. 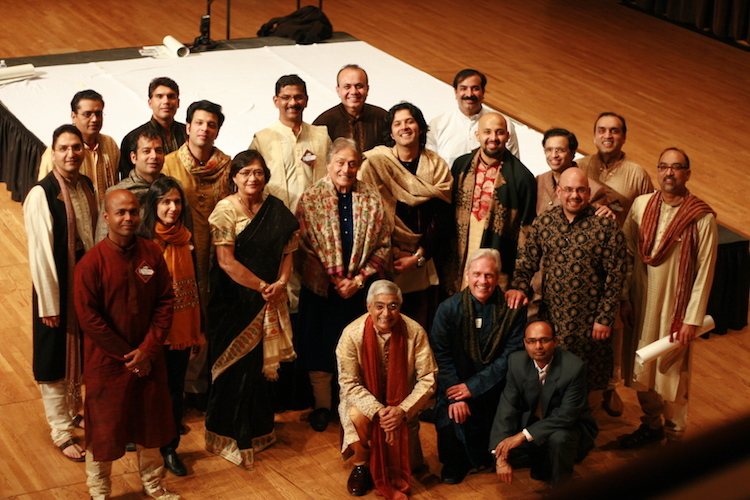 Shruti concerts feature some of the biggest names in classical Indian music. Bookout was among the crowd at Chilakamarri’s daughter’s performance. She teaches a course at IPFW called Traditions in World Music, which includes a section on Indian classical music. Together with Chilakamarri and his friend Dr. Prasad Mantravadi, as well as Deans O’Connell and O’Connor, Bookout envisioned a performance series that would allow her to integrate attendance at live performances into her curriculum. The idea for the IPFW and Shruti Indian Performance Series was born. With that vision in mind, Chilakamarri began asking around to see what kind of support he could count on from others in the local Indian community. Chilakamarri says he wanted to keep his original budget between $10,000 to $15,000 because he felt that anything more would be difficult for five or six people to maintain. But he quickly realized that support for Indian music in northeast Indiana was much greater than he anticipated. “Suddenly I realized that $10,000 or $20,000 was not that hard because people were happy to help,” Chilakamarri says. The next step was to find out if there were any musicians willing to travel to the city to perform. “We started making phone calls based on the artists we knew back in India to see who would come to Fort Wayne,” he says. To his and everyone else’s surprise, he managed to book Zakir Hussain and Pandit Shivkumar Sharma for the first concert. Hussain is a world-renowned musician whose tabla drum playing is featured in film scores like the 1979 war film “Apocalypse Now.” He also performed for President Barack Obama at the White House in 2016. Sharma is an equally beloved artist in Indian culture widely recognized for his innovations with an Indo-Persian string instrument called the santoor. The presence of these Indian stars in northeast Indiana is truly a world-class experience. 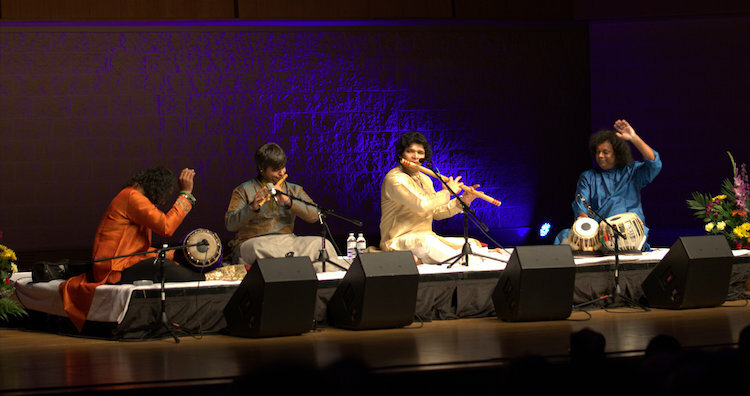 A Shruti performance featuring a bamboo flute duet of Shashank Subramanyam, left, and Rakesh Chaurasia, right. Like Western classical music, traditional Indian music is complex. Any musician familiar with Shruti will emphasize the high skill level of the artists performing in these concerts. But, Alicia Pyle, a former student of Bookout’s who’s gone on to become band leader for a local jazz fusion group, says what makes classical Indian music extra special is the improvisation. “The technical complexity of the Indian songs is similar to that of our classical music, but when you consider they’re improvising a huge percentage of it you can’t help but be blown away by their virtuosity,” Pyle says. Dean O’Connell likewise emphasizes the high status of the artists, which gives students access to the world’s top talent. Any student with an ID can purchase tickets for free, and O’Connell is proud to see attendance by non-Indians steadily growing. But while he sees students appreciate the music, he’s not sure they realize the rarity of what they are experiencing. Shankar performed for a packed house at Shruti’s spring concert in 2017. Like her equally renowned father and guru Ravi Anoushka, she is a master of the sitar. But despite Chilakamarri’s connections to such high-profile performers and his work as one of the city’s top cardiologists, he remains surprisingly unassuming. And his demeanor underlies the purpose of Shruti’s ongoing impact region wide. 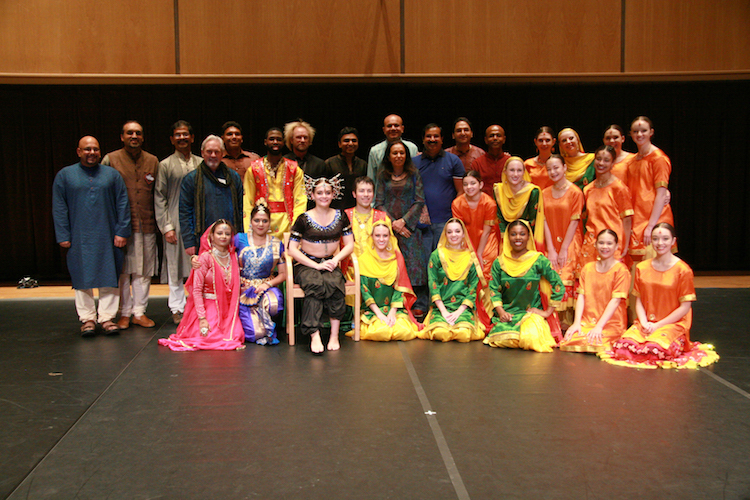 Shruti concerts happen twice a year at IPFW in the spring and fall. As the founder and president of the Shruti Fort Wayne Indian Cultural Society, Chilakamarri is at once soft-spoken and passionately devoted to advocating for his culture and his community. He explains that the decision to focus on classical music and traditional dance in Shruti has nothing to do with a commitment to purism. Instead, it’s about bringing cultures together. He also points out that Bollywood music requires more equipment because they use more instrumentation. So along with a simpler setup, Shruti performances are ideal for collaboration. 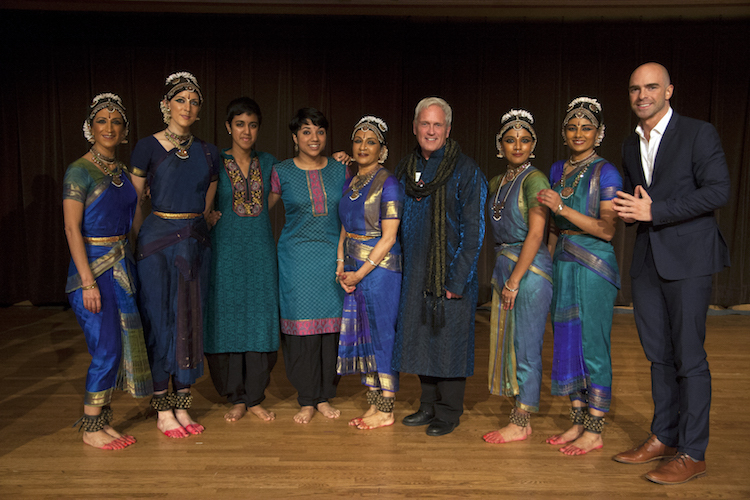 Chilakamarri is delighted that organizations like the Fort Wayne Dance Collective have shown interest in the performances and loves the idea of local dancers incorporating elements of Indian technique into other traditions. “I like the interaction,” he says, leaving open the possibility of further collaborations and performances in different genres. In addition to introducing both second-generation Indian and American students to these fine arts traditions, Chilakamarri takes great delight in seeing his fellow Indians becoming more engaged in the local community. “I’ve made so many friends that I probably never would have met otherwise,” he says. And the impact has gone far beyond his own life. Even Chilakamarri himself has been surprised at how effective the organization has been in breaking down boundaries. It all goes beyond the performances themselves. Many members of the Indian community have discovered other causes and organizations—like Soarin’ Hawks, the raptor rehabilitation center—through their work with Shruti. A group of Shruti performers in colorful traditional dress. Even so, as O'Connell points out, it's easy to feel lost when you're listening to music from a different culture, because you're tempted to place what you're hearing into a familiar frame of reference. Bookout prepares her students for Shruti performances by teaching them about the music's complex structure and having them practice breaking it down into vertical and horizontal elements. 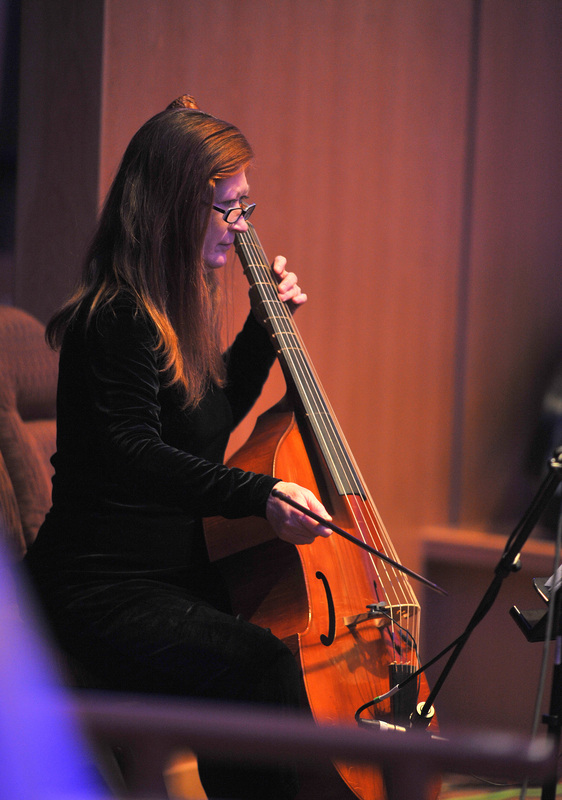 Melanie Bookout is an Associate Professor for the IPFW Department of Music. She explains that Indian classical music has three layers: the drone that provides an underlying “bed” of a single pitch, the drums that establish the tempo, and the melody that can be carried by vocals or an instrument like the sitar. This melodic framework at the beginning of the song is called the “raga,” which means color means "color" or "mood,” and it sets the tone for the music before the improvisation begins. The horizontal elements are the stages in its progression. Next, the accompanist, or vertical elements, are introduced. “And then they come in with their improvisation,” Chilakamarri says. The rest of the performance consists of improvised variations on the ragas introduced in the first stage, often culminating in an intensely lively phase of incredibly rapid drumming—reminiscent of Bollywood. While Bookout says her students have been “wildly enthusiastic” about the music they experience at the Shruti concerts, she has also heard from other audience members who’ve felt somewhat lost during the concerts. While O’Connell admits with some chagrin that his husband was hooked on Indian music the first time he heard it, it took him some time and repeated exposure to personally acquire the taste. “I have a much greater appreciation now than I did six years ago,” he says. But while everyone responds differently to different types of music, Chilakamarri agrees that it doesn’t take any special knowledge of the traditions to appreciate a Shruti performance. Much like any cross-cultural experience, it just takes a willingness to listen. Bookout, O’Connell, and Chilakamarri agree that music taps into something universally human, so by drawing that out into the open, northeast Indiana can savor its beauty as a community. Chilakamarri says the idea is to let the songs transport and transform you, immersing you in an experience that’s not only aesthetic and contemplative, but also spiritually elevating. Save the date for Shruti's spring performance of "Vistarr: A Classical Indian Music Exploration" on March 24, 2018 at the IPFW Auer Performance Hall. The concert will feature Shashank Subramanyam on bamboo flute, Purbayan Chatterjee on sitar, Parupalli Phalgun on mridangam, and Anubrata Chatterjee on tabula. For more information visit www.shrutifortwayne.com. Read more articles by Dennis J. Junk. After earning bachelor’s degrees in anthropology and psychology, and then a master’s in British and American literature, Dennis took up blogging and content marketing for Aptera, a local tech firm. Today, he splits his time between journalism and freelance digital marketing. You can find more of his work at dennisjunk.com.